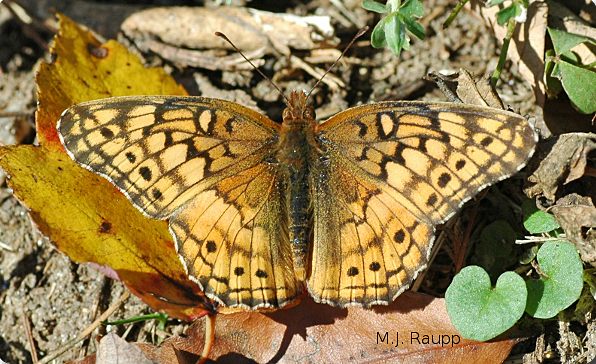 Basking in the late autumn sun warms the variegated fritillary's muscles prior to flight. As the days grow shorter and the nights chillier, butterflies become scarcer. In temperate regions like Maryland, they have prepared for winter in a variety of ways. Some, like the red-spotted purple, spend the winter as larvae in protected silken hibernacula attached to a tree. With the return of spring, adults will emerge and begin a new generation. Others, like the morning cloak, spend the winter as adult butterflies in protected locations such as a hollow of a tree. Still others, like the monarch, have already started their long journey south to overwintering sites in Mexico and California. One particularly mild day last week, I was intrigued by a swarm of butterflies cavorting about my backyard and visiting pansies in my flower beds in the warmth of a late afternoon. Milkweeds are a favored source for nectar and pollen. These small orange and black beauties, variegated fritillaries, are one of the last butterflies active in Maryland at the end of each growing season. Variegated fritillaries are regular visitors to open sunny areas such as fields, pastures, and along the edges of roads where females seek nutritious plants for their young. To the fritillary caterpillar, a good meal includes the leaves of plants such as maypops, may apple, purslane, stonecrop, and moonseed. My landscape isn’t rich in these species, but on a sandy hillside beneath some trees, I have violets and plantain in spades. These plants are fine food for variegated fritillary caterpillars. This is, no doubt, part of the reason the variegated fritillary finds my yard so attractive. This beautiful fritillary caterpillar received a lethal spider bite and never had a chance to form a chrysalis. After feeding on pollen and nectar sources such as butterflyweed, milkweed, dogbane, and red clover, female fritillaries lay eggs on the leaves of the food plants preferred by the larvae. These eggs hatch and the tiny caterpillars munch leaves with powerful jaws. Fritillary caterpillars are gorgeous, dressed in bright bands of orange and white, with stout black spines festooning the body. Sadly, these beautiful little butterflies can’t stay with us much longer. With winter just around the corner, the last of the variegated fritillary butterflies will soon be gone for this year. They are nomads and can only survive winter across the southern tier of states where warm temperatures and food-plants enable larvae and adults to survive year round. With the onset of chilly weather, it’s time to start planning a road trip to somewhere warm and sunny just to make sure the variegated fritillaries survive and will return to visit us again next year.